The NBA had long been the leader in American basketball. However they were slow to introduce a popular part of the game already being used in other professional leagues. The three-point line was first dreamed about in the 1930’s. By the end of the 1960’s the three-point line was being used in the American Basketball League, The Eastern Professional Basketball League and the American Basketball Association. It was not until the late 1970’s that the NBA gave in and decided to use this new rule that they had previously viewed as gimmicky. On October 12, 1979 history was made when the Washington Bullets Kevin Grevey made the first three-pointer in an official NBA game. Grevey would retire after the 1984-85 season with 145 career three-point shots made. From this point on the game would never be the same. This addition to the game added a new level of excitement and suspense. Many NBA games over the last three decades have been ultimately decided by this dreaded shot. From the 1979-80 season to the 1993-94 season the three point line was 23 feet 9 inches from the front of the basket and 22 feet at the corners. The NBA would try to address lower scoring games by bringing the line closer to the basket from the 1994-95 season through the 1996-97 season. At that time three-point line was 22 feet around the entire basket. The league brought back the three-point line back to its original dimensions in the 1997-98 season and it has remained there since. Ray Allen is a player that has had a Hall Of Fame career mostly based on the fact he has been an excellent three-point shooter. His most recent heroics came from his favorite position on the court when he made a game tying 3-pointer in Game 6 of the NBA finals. His team the Miami heat won that game and later won Game 7 of the Finals to be three time NBA Champions. Allen is the all time leader in three-pointers with 2,963 at the time of this article. Ray Allen was also at one point in time the single season leader in this statistical category when he broke Dennis Scott’s record in the 2005-06 season with 269 three-pointers that year. Stephen Curry is now the current single season record holder. He broke Allen’s record at the end of the 2012-13 season when he made his final three-point in the last game of the season, putting the new record at 272 three-pointers. Curry would break his own record two seasons later during the 2014-15 canpaign with 286 three-pointers. The story of Curry’s dominance does not end there. As of February 27, 2016 Curry has made 288 shots from the behind the arch setting a new record and with about two months remaining in the season that mark will continue to rise. 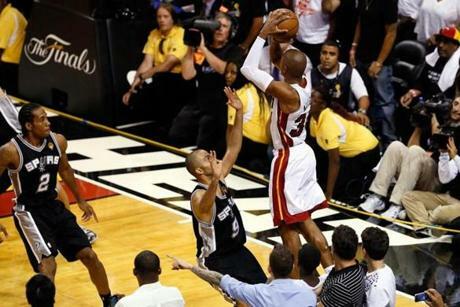 The three-point shot has been such a special part of the game since its creation. It is hard to even imagine the sport without it. It will forever be one of the most revolutionary parts of the game of Basketball. This entry was posted in NBA, sports, Sports History and tagged 1979, 2005-06, 2012-13, 3 point, all time, dennis scott, distance, ever, evolution, first, history, holders, kevin grevey, line, most, NBA, nba finals, pointer, ray allen, record, records, season, shot, stephen curry, three, was where, washington bullets, when, who. Bookmark the permalink. Another in a series of informative and entertaining articles from American Sports History! Well dine Justin! Thank you very much Hank! Anytime Justin! Really enjoy your articles as you know.. I did thanks again for the retweet brother. Pingback: The NHL Needs to Make a Change! | LLOYD-RAGE!